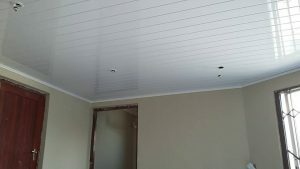 The most of you are already familiar with the PVC ceiling products in recent years, and the products have been swiftly growing in popularity in South Africa as we keep up the push for the products. 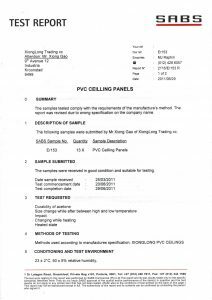 Our company is the most influential manufacturer of PVC ceiling products known under the brand Camfly in South Africa. Camfly products gain the good public praise and approbation in the market depending on absolutely competitive quality, distinct effect and outstanding service. 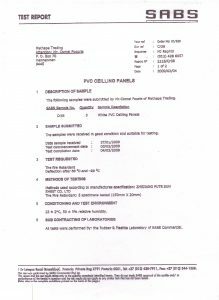 We believe that the quality or performance of every product is becoming increasingly important, unfortunately, however, we have seen thousands of unknown PVC ceiling products with inferior quality are inundating the whole of South Africa, they are boldly invading the industry and damaging the existing market with impunity. With the Camfly range also being eco – friendly and oxidation resistance, easy to clean, both sound and heat proof; Camfly is the irrefutable one stop product ceiling. The most important aspects of any ceiling installation whether it be household or corporate is safety. 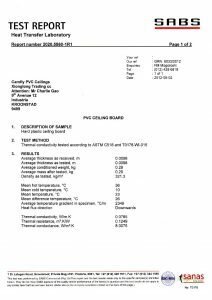 Therefore it important to know that the Camfly PVC ceiling range has passed the National Fire Protection Inspection tests for fire resistance standards. With such qualities it will be difficult to find a alternative product which attains the beauty and elegance of modern architectural design and at the same time being cost effective, eco-friendly and conforms to National Health Standards. We challenge you to elevate your Standard of living to the next level and create the INSPIRED living space you DESERVE. Largest PVC ceiling supplier worldwide. The PVC Ceilings are also easy to instal. Problems like rotting, No fungi can grow PVC. Practically any automated or manual processing. 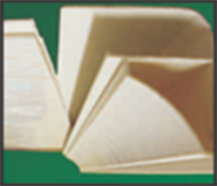 Our products are very durable more than 20 years. Camfly factory is affiliated to the company Xionglong Trading (Pty) Ltd. It was founded in 2008 and started as a ceiling manufacturing business that supplied PVC products in South Africa. 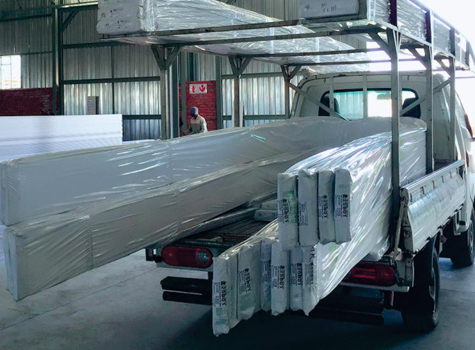 The company Xionglong Trading (Pty) Ltd is the first and biggest manufacturer in South Africa, having as main activity the producing and supply of a variety of different Camfly PVC profiles offerings (PVC Ceiling panels, PVC Wall panels, PVC Cornices, PVC Trims & Jointers). 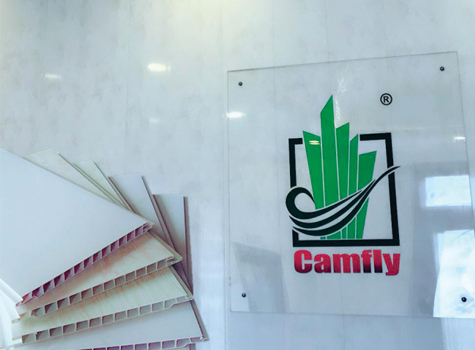 From the start of business, Camfly focussed on making use of only the best quality raw materials to ensure that our products are of the best quality with the highest content of PVC, meet the traits or standards of local housing construction and outlast any of our customers’ expectations. Our products are built by advanced machinery and skilled technicians that are closely monitored and continuously trained and tested. We strive not only to continuously grow, but also to consistently deliver high quality products backed by excellent service. 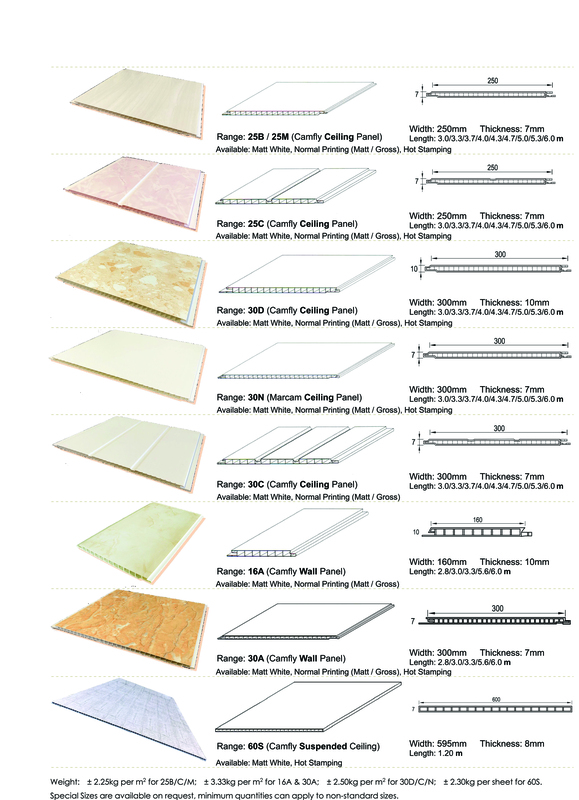 Camfly has provided large quantities of top quality PVC ceiling products to our existing customer base since 2009. We are proud to mention that currently, a few of our products are now supplied to RDP housing contractors. Due to an increase in demand, we had proudly expanded our manufacturing capacity which had led to our producing department relocating to larger premises in 2015. Our products are used all over South Africa and abroad in several countries of Southern Africa. Through focusing continuously on our core value’s, we strive to use only the best quality materials in the construction of our products, be consistent in all that we do, build valuable relationships based on mutual trust and dependability. 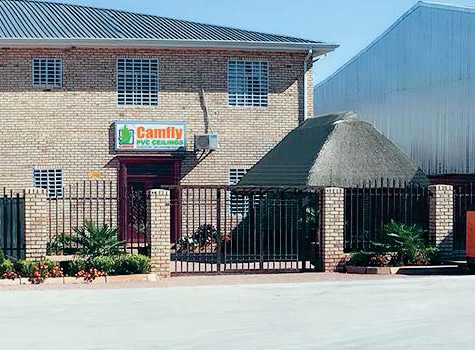 With a total area of 28 000 square meters, out of which 8 000 square meters are used as production and warehousing spaces and with its own car fleet, the company ensures the prompt and immediate delivery of the Camfly products to all its customers. 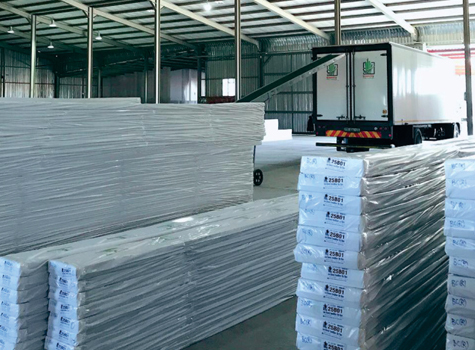 The constant stocks from the warehouses enable quick and flexible deliveries, the purchase orders being delivered within the shortest possible time. Due to the quality of the Camfly products, the company Xionglong Trading (Pty) Ltd has a permanently growing network of customers. Make Camfly your number one choice in a solution provider for your finishes that will be the hallmark of your dream living space. The first and biggest manufacturer with more years professional services and abundant marketing experiences in South Africa. Formidable Productivity and Timely Delivery. Quality Standards and Production Requirements by the climatic condition and building situation of South Africa. Prompt Orders Processing, Ideal Lead Times. No Timely Delivery, Long Lead Times. Camfly Non-Camfly Absolutely high content of raw PVC (Polyvinyl Chloride). Far lower than standard requirement. Mixed with waste materials. 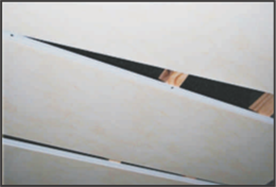 A strong and firm plate body to resist the back pressure between ceiling board and roof. Fragile, Insufficiently firm. 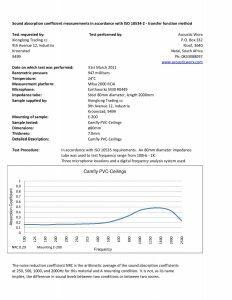 Lower compressive strength. Accidents frequently happen due to quality. Flexible and suitable for bowing even bending (available for Series 258 & 25C). Much easier to load or unload and install. Much better visual effects, Hardly any color difference. Frequently occurring color difference due to discontinued supplies. Any special sizes can be customized (up to 15 metres). Camfly is available in a large variety of finishes, colors and patterns to cater to anyone’s preferences. Single and stationary size. Length of 3.9m or 5.9m is available only. Unable to cater for special customization. Far More Cost Effective / Cost Performance. More Excellent Durability. Factory-warranted Quality. Camfly Products are of the highest quality and come with a product guarantee of 20 years. Briefer Product Lifetime. No Warranty. Authentic Guarantee of Local Manufacturer. 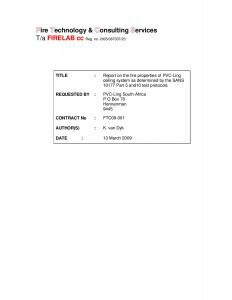 Report on the fire properties from FIRELAB cc (13 March, 2009 Contract No. FTC09-001). 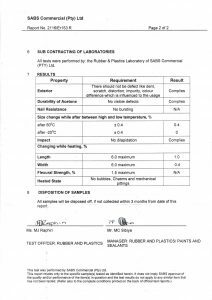 The overall classification of B/B1/B2 is applicable to this product in terms of the SANS 428 Specification. The Fire Retardant Burnt the sample with spirit Iamb flame for 3 seconds, the panel burn, but the sample extinguished once away from the flame. Deflection after 60°C The PVC board was placed on the metals tray, and then put into the air-circulating over of 60°C, the sample was placed in the oven for 10min. The sample qualifies below 6% of board width. Deflection after -20°C The PVC board was placed on the metals tray, and then put into the cold chamber of -20°C, kept in the temperature for 10min. The sample qualifies below 5% of board width. Before installation, all the profiles need to be checked to make sure they have the same length or lengths corresponding to the wall panel’s surface. In cases of damp, damaged or uneven walls we recommend the use of treated timbers for framework. 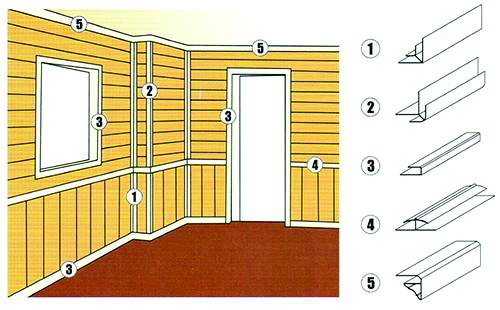 Necessary Materials for The Installation: PVC Wall Panels, PVC Top Corners (e F2-L), PVC Connective Jointers (0 H-L), PVC End Trims (C) 7-L), PVC Internal Jointers (0 W-L), PVC External Jointers (0 Y-L), Stalls for Wood, Plastic Dowels, Wooden Branderings, Nails and Screws. 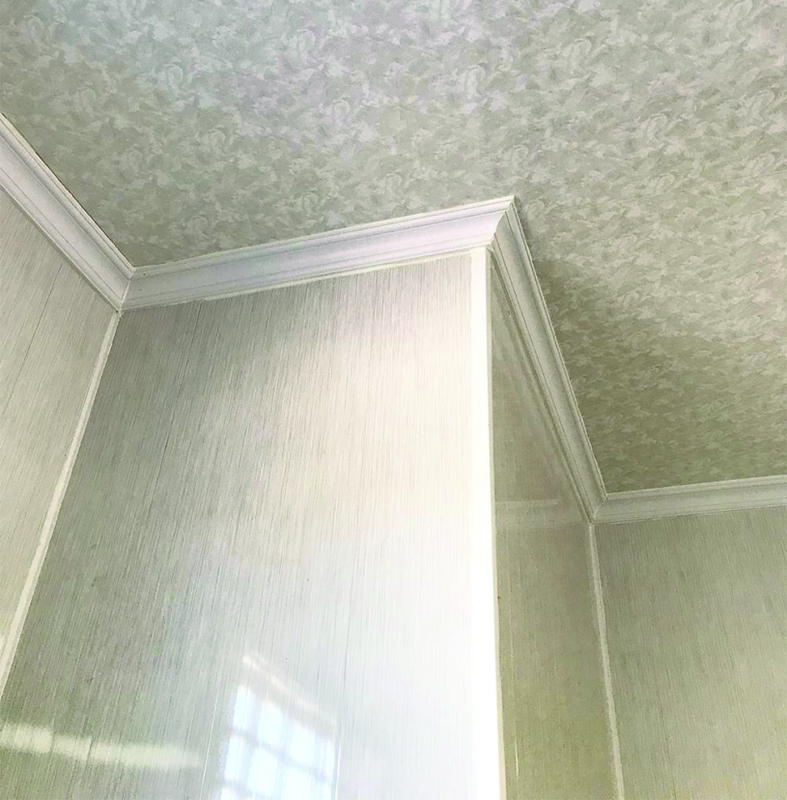 For wall panels or ceiling panels, the spots of the dowels are traced out on masonry in order to fix the wooden brandering or galvanized steel, having the dimension 15mm x 50mm. The distance between the dowels is of 120mm – 150 mm and between the wooden branderings of 350mm – 400mm (for the lower part of the walls or for the ceilings we recommend the distance between the wooden branderings to be max. 250mm — 300mm). The fixing of the wooden branderings in dowels is made with screws for wood having the dimension 3.5 — 4 x 50 – 60 mm. If the masonry allows it and if you want the panel to be glued on the wall, bury the strip boards inside the masonry. PVC End Trim is placed along the installation space (floor, ceiling) parallel to the wooden framework. 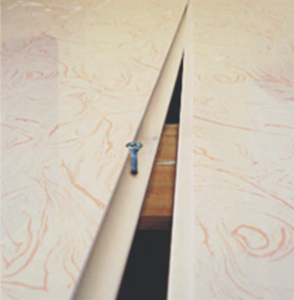 Begin the installation from one of the edges, select the first wall-panel and trim off the tongue on the left-side of the panel and cut to length. Place the wall panel onto the framework into the PVC End Trim with the front of the panel towards you and the groove-side to the right. Fasten the panel on the groove-side by the end lip using screws to fix it entirely to the framework. Select the next panel, put the tongue in the groove until you have a good fit, and fasten the panel again on the groove side using the same method as before, and continue this way until you hit the edge or until the corner of wall. The interior and the exterior corners are executed with PVC Internal Jointers or External Jointers, as necessary. At corners, cut the last piece of panel near the wall of an interior cell, and apply the external or the internal corner on it. When completing the installation, introduce the End Trim at the end, this finishes the work. In case of a flat and even wall, a simple adhesive can be used without having to use a wooden framework. 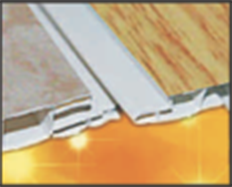 The PVC panels even can be glued straight onto existing ceramic tiles, without removing these tiles. Painted surfaces should be suitably prepared before applying any adhesive. Use the panel for indoor uses only. The ceiling panels shall not be exposed to direct sunlight. It is forbidden to kick with hard elements. It is forbidden to clean the surfaces with abrasive materials or with solvents. The electrical equipment need to be properly fixed before installing the ceiling panels. The ceiling panels need to be checked prior to installation. 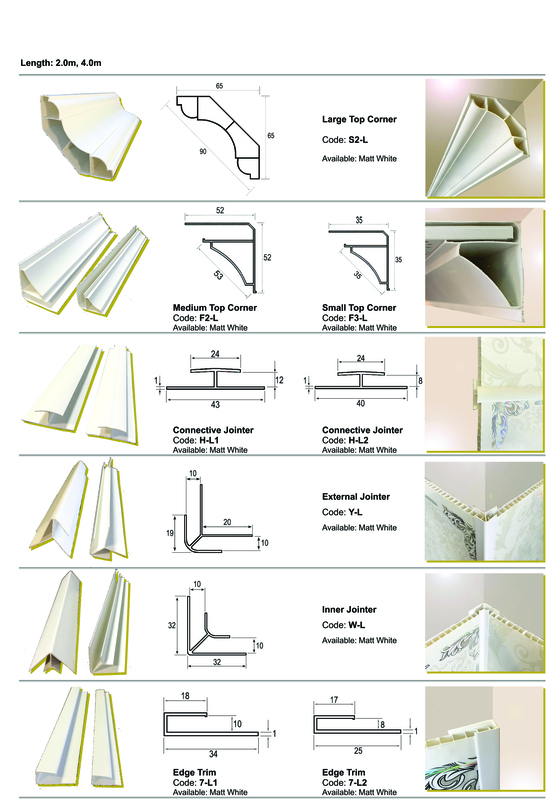 Ensure that you are using the same batch of ceiling panels in one area. When using the ceiling panels in high back-pressure from rooftop, please more properly fix panels and strongly fasten screws, or use silicon sealant in the groove on the back of the lip. Before fitting panels around sources of heat, for example radiators or fire places, make sure the temperature level doesn’t exceed allowed level of 60°C.